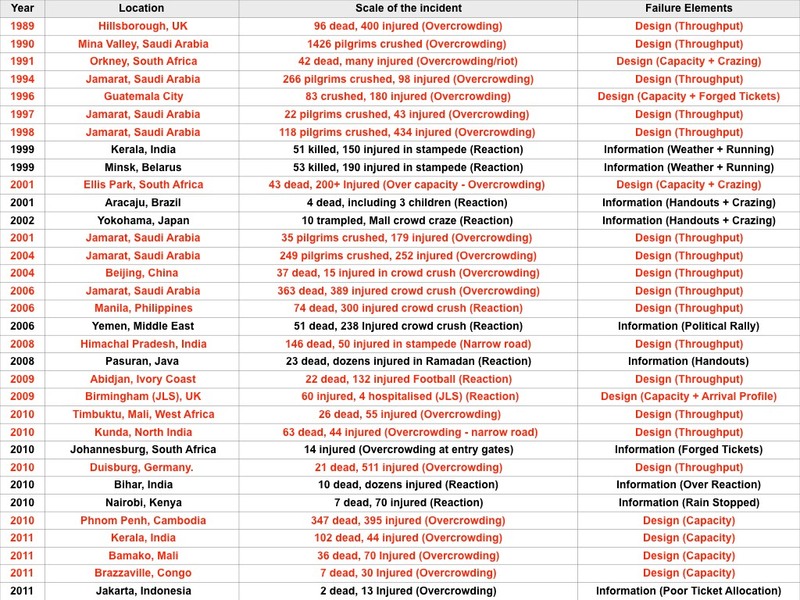 Some of the major incidents over the last 30 years. 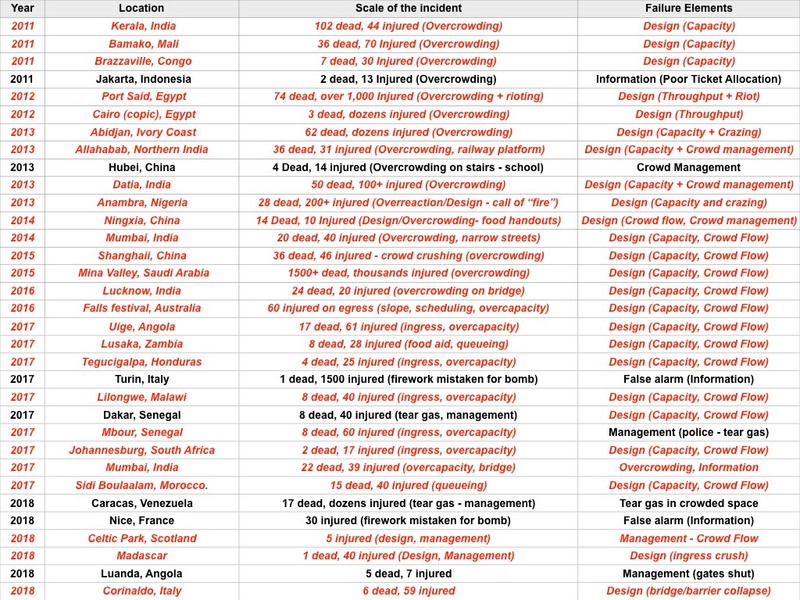 We have highlighted those disasters that�have a design issue (shown as red above) as the fundamental (or distal) causality.�Namely, the design (space) was not sufficiently robust for the anticipated crowds. Failing to understand the design capacity and throughput, and/or failing to anticipate the crowd numbers is a recipe for disaster, and a fundamental element of crowd risk analysis.�This highlights that teaching the principles and applications of how to analyse crowd flow rates, fill times and capacity would have had a significant improvements to crowd safety and saved lives. The concept of a model. 1. ��The actual exercise of building a model often reveals relationships which were not immediately apparent. As a result a greater understanding is achieved through the modelling process. 2. ��Having built a model it is usually possible to analyse the model, which helps suggest courses which might not otherwise be apparent. 3. ��Experimentation is possible with a model whereas it is often not possible (or desirable) to experiment with the object being modelled. It would clearly be dangerous to experiment with large numbers of people moving in and out of a stadium if there was a possibility that anyone may be hurt in the process. Be cautious of simulation outputs that do not state their assumptions.�There are many good crowd simulations in the market today, however, these are vastly outweighed by bad, dangerous and misleading crowd simulations. An animation (such as a cartoon) can look realistic but have no modelling or simulation properties (such as a series of artistic impressions of how a system may look). Animations can be an output of a model - or just some artists impression of what he/she thinks it may look like. You needs to understand the differences between an animation of a model (or simulation) or a simple animation (to perhaps�illustrate some complex process) or an animated simulation. These are all useful tools but animations, simulations and model are three very different types of representations of reality. In order to understand some aspect of a system it helps to simplify it as much as possible, and to include only those properties and characteristics that are essential to understanding. If you want to determine how an object drops, you don't concern yourself with whether it is new or old, is red of green, has odour or not. You eliminate those things and do not needlessly complicate matters. There is a basic principle involved in the modelling/simulation process called the "least possible simulation" (LPS) which states that a simulation gains in complexity faster than the object being simulated does until, eventually, the simulation catches up with the phenomenon. It was established years ago (Information Theory and the "Shannon Entropy" concept) that you simply cannot produce something that has less information than the thing you are claiming to simulate.�Or to put it another way, a system, in it's full complexity, cannot be represented by any simulation smaller than itself. Thus, no crowd modelling system could claim to model the whole range of human behaviour, without FIRST understanding the WHOLE range of human behaviour. The Shannon principle is simple to express in that, what is "knowable" about a system can be modelled using simulations. There are a lot of models that make�false claims (or worse use�limiting factors that the modeller is either ignorant of, or chooses to ignore) the user needs to be aware of the limits of his/her system and specifically the Shannon Entropy principle. One important addition to the Shannon Entropy principle relates to complexity and emergence. Namely that a system of "simple" things can exhibit the apparent complexity of something that has "more information" however this needs further clarification. To quote from my PhD. This leads us to the logical conclusion that if the simulation satisfies the process of the behaviour from the proven underlying mechanisms, we have demonstrated the existence of the phenomenon as a well-constructed scientific object. Note that this does NOT contradict the principles of Shannon Entropy in that I only claim to model an ELEMENT of crowd behaviour (ie: simulated annealing as a good proxy for evaluating crowd dynamics with respect to risk). I strongly disagree with any system that claims to model "the whole range of human behaviour" to any given situation and would ask for good third party and independent validation before I would entertain any such concept. No one has risen to that challenge yet. Animations are relevant to the process of understanding the dynamics of a complex system. Typically taking the form of computer simulations using graphical representations of a process. They may be real-time animations or replayed animations from a file. It is important to understand the process behind an animation, how it was constructed and what elements it displays. We can make the following general observations about the simulation approach to decision making.�Simulation is most appropriate when the problem is too complex or difficult to solve using another method. A model must be developed to represent the various relationships existing in the problem situation. A process such as random-number procedures must be employed to generate values for the probabilistic components of the model. A bookkeeping procedure must be developed to keep track of what is happening in the simulation process. The simulation process must be conducted for many periods in order to establish the long-run averages for the decision alternatives or other changes in the system. Ergodic analysis (long term averages) should be the purpose of the simulation system. Local transient effects can skew simulation results - as can bad model building - it is essential that simulation� builders be scrutinised in the same way one would scrutinise the simulation system. A decision support simulation needs to be validated and open to scrutiny. Good third party validation is essential to be confident of any simulation system. A complex problem can be analysed and solved using a computer simulation.�We can make the following general observations about the simulation approach to decision making. Simulation is most appropriate when the problem is too complex or difficult to solve using another method. Because of the numerous calculations required in most simulations, a computer program or simulator is required. The simulation process must be conducted for many days or periods in order to establish the long-run averages for the decision alternatives or other changes in the system.